‘Reflective Learning’ is currently a major topic of conversation among development professionals. Everyone recognizes learning as a process for acquisition of knowledge or skills through study, experience, or being taught. But the major question that concerns all is: how can learning be made more effective? Is it possible to reflect upon what one has learned? ‘Reflective learning’ is the concise answer to all these questions. Reflective learning involves learners thinking about what they have read, done, or learned, relating the lesson at hand to their own lives and making meaning out of the material. It’s more than just memorizing some facts.In short, reflection turns experience into learning. This inspiring book, ‘Reflection Methods: Practical Guide for Trainers and Facilitators’. 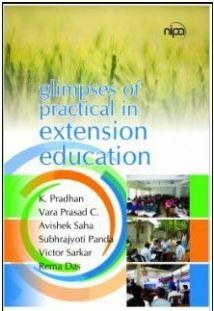 delivers an interesting account of various methods/tools for reflective learning. 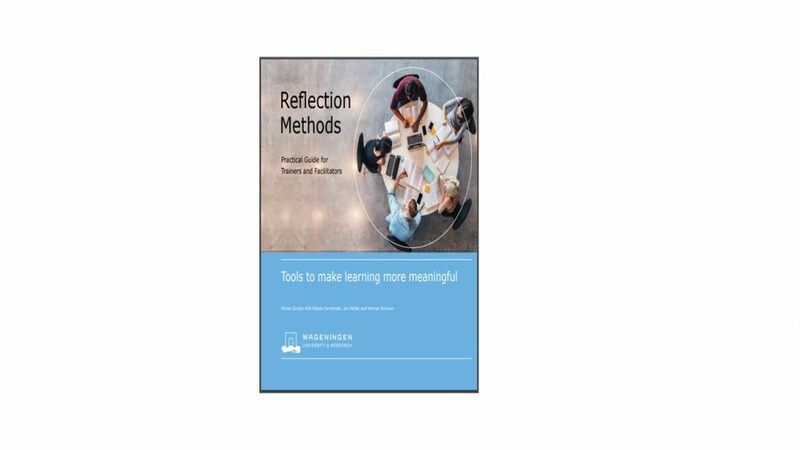 These reflective learning tools have been developed for facilitators, teachers, and trainers who consider reflection as an important element in the learning processes they facilitate. This guide has various methods that can be used in a learning session to make it more meaningful in a way that allows individuals to review and understand an experience and the ensuing knowledge that is acquired during a training course, a workshop, or a longer-term capacity development process. The purpose is to make learning more explicit and evocative, thereby contributing to improved professional performance of individuals and (multi-stakeholder) teams. Starting with the concept of reflective learning,the authors explain what it is, and what it is not. In this era of globalization, ICTs are advancing every day to a new level and reaching more and more people at a high speed. In turn, this exposes them to copious amounts of information, concepts, world views, and experiences. This can be stimulating for learners, but also confusing, leading to a feeling of being overwhelmed. At this point, reflection is a method for looking back at what has been learned. 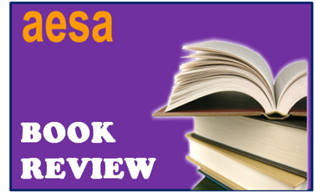 Here, the authors explain the meaning of ‘reflective learning’, and its importance by providing evidences from various related literatures. The second unit is based purely on concepts, theories and models of learning. Here, the authors are specific and to the point while explaining various theories; they have laid special emphasis on explaining the most relevant ones, such as Kolbs’ cyclical model of learning that helps to do, reflect, think, and plan through ‘Active Experimentation’. They then go on to explain the ‘Triple-loop learning model’, which can be used to improve ourinsights on learning by simplifying our understanding of how the process of competent learning takes place. Later they move on to ‘Adult Learning’ that shares their comprehensive idea about working with professionals, who are adults. Finally, they explain ‘Learning Outcome Typology’ where reflection happens around three different dimensions, viz., knowledge, attitude, and skills. In the flow of the book we come to see that these concepts and theories have been applied in different facilitation methods. 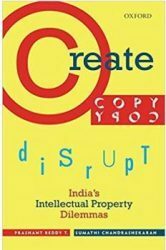 In this section authors have taken special effort to make these theories clear to the reader by adding pictures and diagrams, and these impart extra value to the explanation. The next section deals with the ‘Facilitation’process, which is the main focus of this book. This section make one realise the importance of multiple roles (convener, moderator, and catalyst) played by a facilitator in strengthening learning dynamics. The authors have organised the entire facilitation process into nine steps, and each step includes a number of reflection methods (Figure 1). 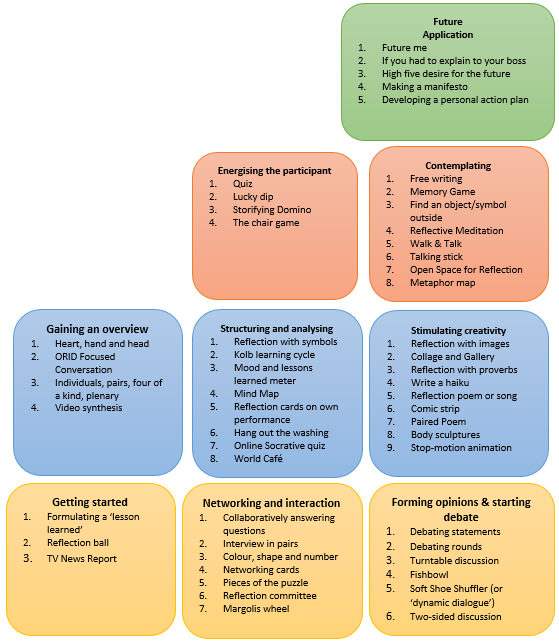 This gives a clear idea onwhat method to use and when.These reflection methods are discussed in the last unit. While going through each of these methods I found many interesting, funny, and meaningful methods –these can reduce the boredomof a meeting or workshop. Overall, this book deserves appreciation for the way it has organized its interesting contents. 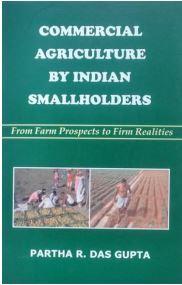 All the units and subsections maintained continuity throughout, and this helps the reader to understand exactly what the authors want to tell him/her.Each reflection method is explained in detail with pictures and diagrams and it makes the reader capable of adapting these methods when s/he facilitates a programme/conference/meeting. Personally, I think it is an excellent guide forenthusiastic facilitators who are in search of different techniques to make their workshops/meetings/conferences interesting. This handbook is inspirational and provides many methods for better facilitation of events. This is one of the best as well as inspiring books I have read so far on this topic. 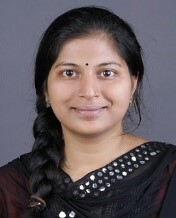 Athira E (baburaj.athira11@gmail.com) is a Senior Research Fellow at Center for Research on Innovation and Science Policy (CRISP), Hyderabad.